Even though I lived in France for three years while doing my doctoral studies, I never managed a visit to Mont Saint-Michel, the mysterious, mystical, and hauntingly photogenic abbey situated on a promontory just off the Normandy coast between Caen and St. Malo. But last week, in connection with the filming for my Pivotal Players series, my team and I made the pilgrimage. I first spied the mount from the backseat of the van, when we were still many miles away. It looked like a great ship, moored on the line of the horizon. As we got closer, the place became increasingly impressive, sometimes looming like a fortress, other times seeming to float on the sea. When we entered the gates this morning to commence our work, we stepped out of our world and into the Middle Ages. Our climb to the top—arduous and steep—mimicked that of thousands of pilgrims and monks and spiritual seekers over the centuries. To grasp the religious significance of the Mount, we have to remember that it was built on the edge. 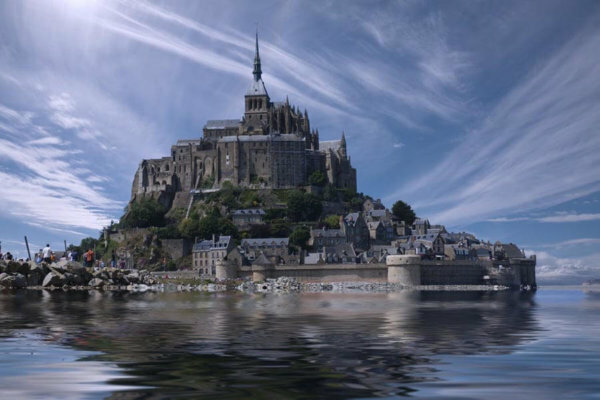 Like the Irish monks who constructed their simple dwellings off the harsh western coast of their homeland, the religious who gave rise to Mont Saint-Michel felt that they were doing their work, quite literally, at the ends of the earth. Jesus told his disciples to proclaim the Gospel everywhere and not to stop until they had gone all the way. Cardinal Francis George loved to relate the story of his brothers in the Oblates of Mary Immaculate, who, taking Jesus at his word, declared the resurrection to every village and hamlet in the Yukon, until they came finally to the people who said, “There’s no one beyond us.” Mont Saint-Michel was intended to be a monument to the thoroughness of the Christian missionary effort. Hence it was, to me, a vivid reminder that we need to pick up our game today and to go to what Pope Francis has famously termed the periferia, a border country more existential than geographical. I have discovered now through direct experience, though I had certainly sensed it through photographs, that it is practically impossible to gaze at Mont Saint-Michel without falling into mystical reverie. I would challenge anyone to come here and walk the causeway leading up to the mount and not find himself beguiled into thinking of things higher and more eternal. The mountain itself, and then the architecture piled so exquisitely on top of it, draw the viewer’s eyes up and up, beyond this world. And when you climb to the top, you look out on the trackless and seemingly endless sea. From Plato, through Dante, to James Joyce, the trope of the open sea has been used to evoke the transcendent goal of the searching heart. 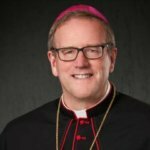 The art, the sacraments, the doctrine, and the saints of the church are meant to lure us to the edge of the ordinary and to allow us at least a glimpse of that open sea of God’s eternity. They are, accordingly, the enemies of Charles Taylor’s “buffered self,” the modern person so thoroughly shaped by secularist ideology that she no longer hears the rumors of angels. It has always struck me as curious that a religious person is seen as somehow conventional and non-threatening, a little fussy Ned Flanders. Authentic Christians are in fact edgy folks, more than a bit dangerous. Mont Saint-Michel, standing on the border between heaven and earth, is just the kind of place those dangerous types like to go. Finally, to understand this sacred place, we should remember its name and the figure who stands on the pinnacle of the spire, namely, Michael the Archangel. Michael is invariably depicted in the armor of a warrior, for he is the general of the angelic army that stood athwart the legions of Lucifer, who had dared to arrogate to himself the prerogatives of God. He fought, not with sword and spear, but with the unanswerable challenge of his own name: Micha-el (Who is like God?). Now we should recall that the Mount is situated precisely on the western border of Europe, looking out toward the setting sun. In the medieval imagination, the land of the setting sun was associated with the powers of darkness, which helps to explain why the great cathedrals of the Middle Ages were, almost without exception, oriented, situated toward the east. They symbolized the Church turned toward the light of the risen Christ and away from sin and death. So the stronghold, named for and topped by the fighter angel, and erected on the western edge of the world, represents the power of Christ’s Church turned against the forces of darkness, both visible and invisible. As we were filming at Mont Saint-Michel, armies of tourists were making their way through the myriad nooks and crannies of the place. As they passed by altars, sanctuaries, and monastic cells used by monks long ago, many of them, I would venture to say, probably saw the ensemble as redolent more of Harry Potter than of St. Anselm. Come here if you can, or at least find a good photo of the Mount on the Internet, but don’t look at it in the manner of a tourist. Rather, see it as its builders would have seen it: as a beautiful and holy monument on the edge of the world.